My 10-year-old son Bode raced across the zipline’s platform and launched himself toward Provo Canyon’s forested abyss, surrendering to the distinct sound of the rig’s trolley rapidly racing across the steel cables. “I believe I can fly!” he shouted as the wind hit his face. All of this is less than 50 minutes from the Salt Lake International Airport and a stone’s throw away from Park City. From land to water to air, the Heber Valley has something for everyone. With 200 miles of trails suitable for hiking, mountain biking and ATVing, this valley is the modern-day Land of Milk and Honey. Hiking: Mount Timpanogos is the crowning achievement of the valley’s landscape with two strenuous routes up the mountain. For a more leisurely excursion, don’t miss the half-mile nature trail at Cascade Springs, a refreshing oasis of verdant vegetation, cascading waterfalls and inviting pools. Memorial Hill is a popular 1-mile circuitous jaunt in Midway that offers a 360-degree view of the valley with monuments honoring U.S. servicemen and women at the summit. 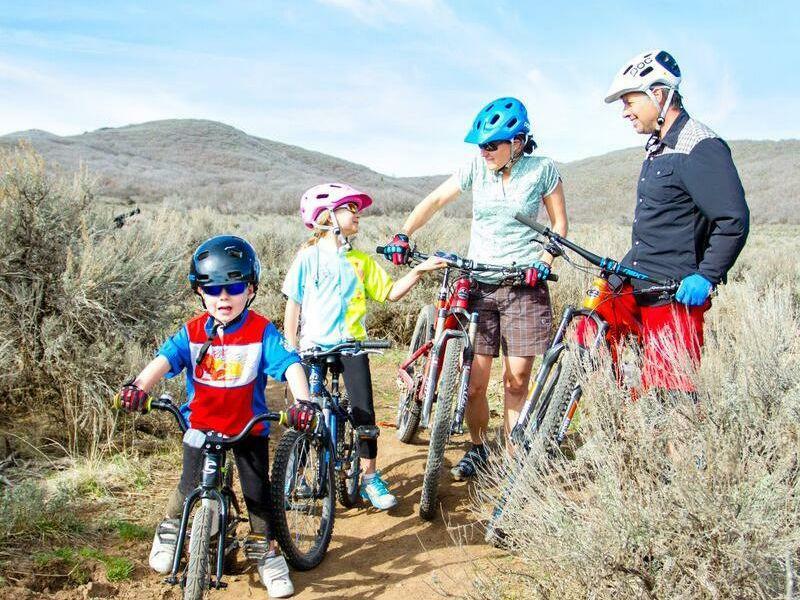 Biking: Wasatch Mountain State Park preserves nearly 23,000 acres for mountain biking, hiking, camping, golfing, ATVing and fishing. 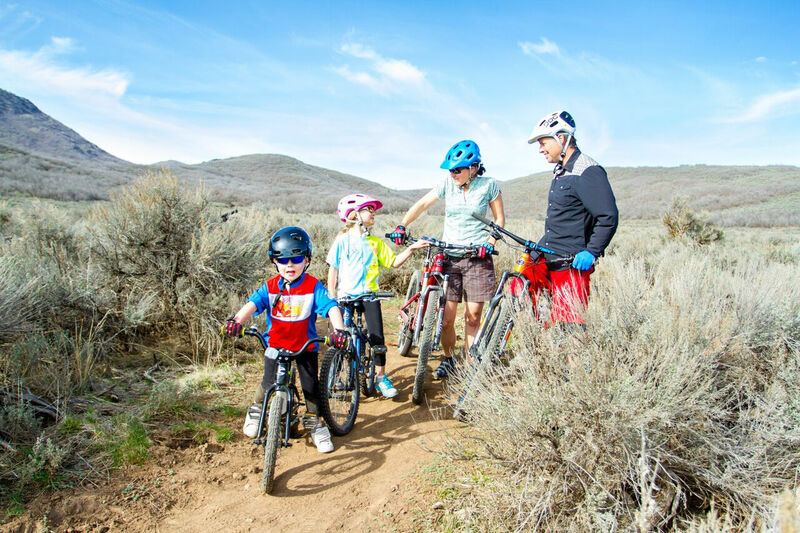 The Dutch Hollow Trail System has almost 20 miles of singletrack while the WOW (Wasatch Over Wasatch) Trail is a more strenuous ride that extends 9.2 miles from Wasatch Mountain State Park to Hardy Lake near Deer Valley. 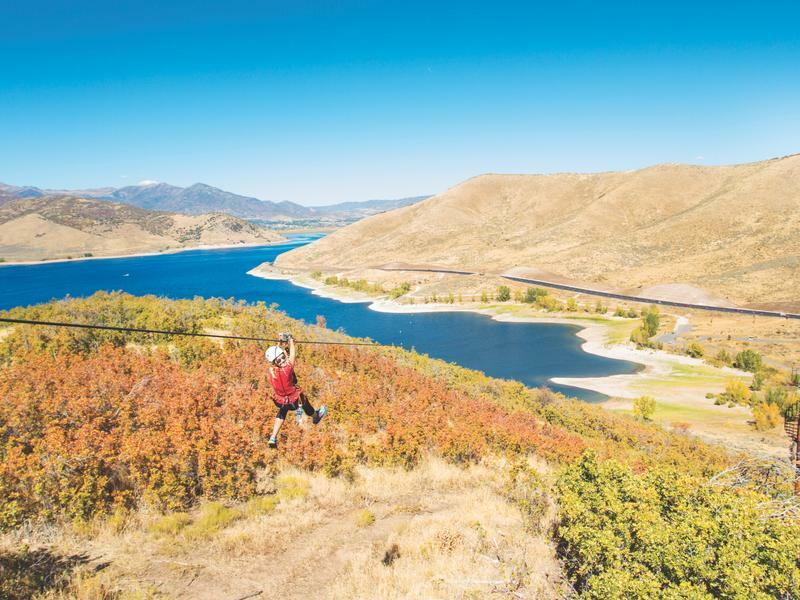 For a more kid-friendly outing, the Deer Creek Trail runs 9 miles along the western hillside above the shores of Deer Creek Reservoir. Insider’s Tip: If you pass through Midway on a Monday evening, don’t be surprised if you encounter a swarm of locals of all ages happily buzzing through this pastoral mountain village on their bikes. Welcome to the Monday Midway Cruiser Cruise, a grassroots “slow ride” that runs May through September. Locals meet behind Midway Town Hall at 7 p.m. and casually wind through the town’s backstreets. For additional local charms, be sure to indulge in cheese samples at Heber Valley Artisan Cheese, and Süss Cookie Company regularly serves up fresh treats and delicious community classes. From reservoirs to a geothermal crater, adventures in the Heber Valley are not just limited to land. Jordanelle State Park: One of Utah’s most popular state parks, Jordanelle State Park has camping, boating, swimming, kayaking and fishing. The Aqua x Zone is an inflatable watersports park that allows up to 65 people to run, jump, swing and swim on a variety of obstacles like The Curve, a 20-foot-long raceway. For a unique camping adventure, Floating Campgrounds recently opened their new two-level dock for a boat-in camping experience with a private bathroom, gas fire pit and a top level deck for sunbathing and sleeping. Homestead Crater: One of the Heber Valley’s most famous features is the Homestead Crater, a 95-degree geothermal hot springs covertly ensconced in a natural cave. Upon entering the tunnel you’ll swear you’ve been teleported to the Caribbean’s azure-blue waters where you can take a therapeutic soak or a SUP yoga class. The 65-foot-deep crater also offers PADI Open Water certifications. The Others: Deer Creek is a medium-sized reservoir that offers excellent boating and fishing, not to mention the area’s best view of Mount Timpanogos. If you want to try kiteboarding, Uinta Kiting is the only Kiteboarding School permitted to teach in a Utah State Park. On the east side of the Heber Valley, Strawberry Reservoir is renowned as an excellent trout fishery, and be sure to try your hand (or rod) in The Middle Provo, one of the most popular fly-fishing streams in the State of Utah. 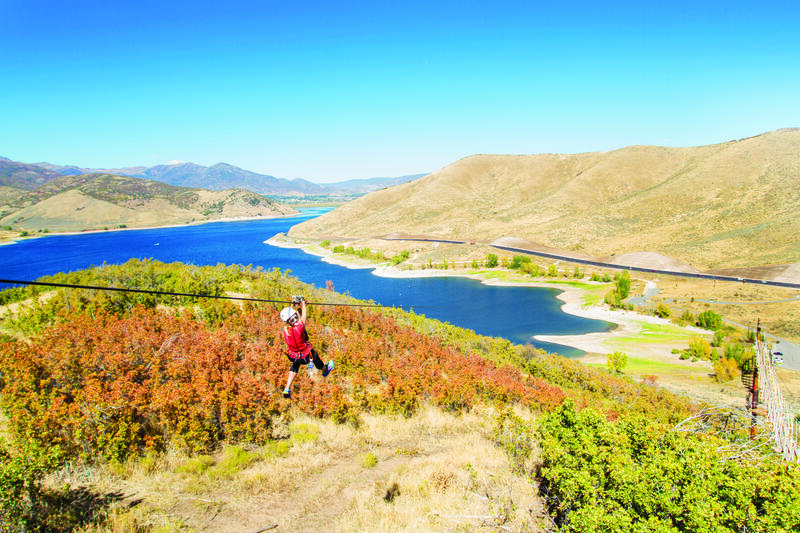 Your wings may be secured with a harness, but the Heber Valley’s two zipline courses are about as close as you’ll get to flying. Or, if you really want to fly, there’s an option for that too. Soar Utah: Take a thrilling glider ride for a true bird’s eye view of the entire Heber Valley. Nothing quite compares to peaceful exhilaration of gliding, soaring gracefully with only the sound of the wind rushing over the wings. The views alone are worth it. Operating out of the Heber City Airport, Soar Utah offers scenic glider rides May through October. Provo Canyon Adventures: Rocky Mountain Outfitters, known for their horseback riding and guided fly-fishing services, recently acquired this canopy zipline tour nestled in Provo Canyon. Your adventure starts with a Ranger ride to the top of the course, followed by a series of five action-packed ziplines overlooking the Provo River. This is the perfect course for families or those who don’t want something physically demanding but still offers plenty of excitement. 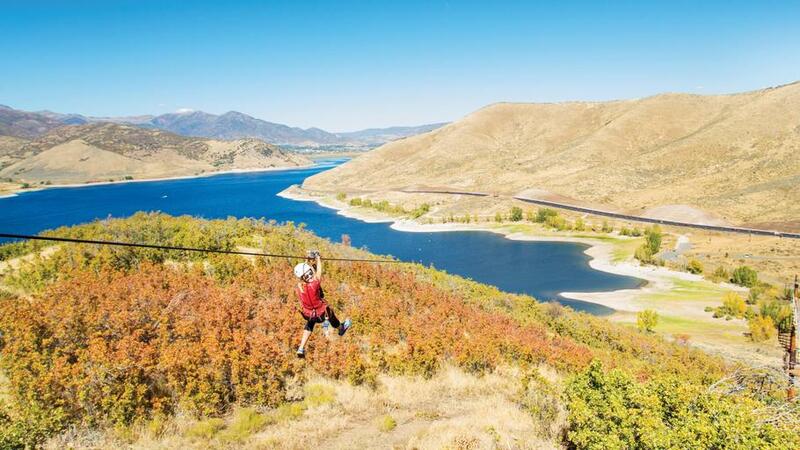 Zipline Utah: The Screaming Falcon is the longest continuous zipline over water in the world and the second longest in the lower 48. “This is not an easy ‘Disneyland’ experience where your guides do all the work; it’s an adventure zipline course,” said owner Jon Johnson. There are a few à la carte tour options ranging from 1 to 3 hours; my daughter and I had an exhaustingly fun time on Kingfisher, the second largest course with 7 ziplines and 2 aerial bridges. Rest assured, so is the rest of the Heber Valley!